Chart positions for “The Book of Souls” have started to pop in. 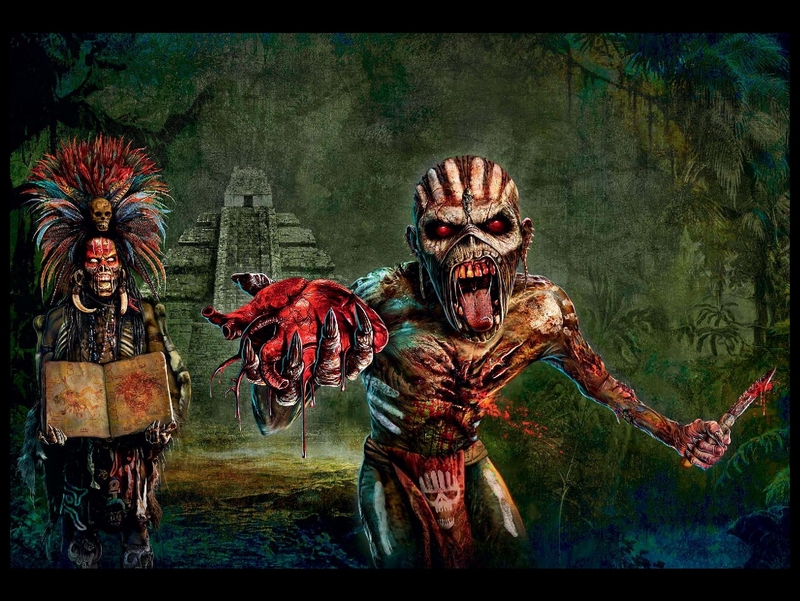 See how Iron Maiden‘s 16th album are doing around the globe. First week sales from many markets are finalized and the first chart positions have started to appear. Maiden’s previous 1effort, “The Final Frontier”, went to number 1 in a record breaking 28 countries around the globe when it was released five years ago. Let’s see how “The Book of Souls” holds up. Eddie’s ultimate sacrifice seems to have paid off. Maiden are expected to land a 5th number one in their home country UK and are currently at number 4 in the US when 87% of the list accounted for. At this point they registered 58.150 sales for “The Book of Souls” which is just marginally behind the first week sales of “The Final Frontier”, which shifted 63.000 copies. By the looks of it “The Book of Souls” will end up with around 70.000 sold units in the States when the week is over. Taking the massive drop in physical album sales over the past five years, this is a impressive result. UPDATE 1: UK number 1 confirmed. Apparently it has reached silver status in UK already with 60.000 units in the first week. That’s a massive step up from “The Final Frontier”, which sold 44.385 copies in the UK in the first week. UPDATE 2: Number 1 in Italy. UPDATE 3: Number 2 in France, which is one down from “The Final Frontiers” number 1 entry. So far we have two down (France and New Zealand) and two new number one entries (Belgium Flanders and Netherlands). UPDATE 4: Number 1 in Sweden like last time. Like in the UK, this marks the 5th number 1 in Sweden. UPDATE 5: Number 6 in Japan. One step down from TFF, which went to number 5. Still the 2nd highest ranking of all time. UPDATE 6: Maiden are officially number 4 in the US. In other words they did not manage to better the position “The Final Frontier” reached in 2010 although the first week sales of 68.400 units is a nice improvement from the 63.000 they shifted in 2010. UPDATE 7: “The Book of Souls” is number 2 in Australia. Same as last time. UPDATE 8: Iron Maiden is number 1 in the Canadian midweek charts. Time will tell if they will secure the spot. UPDATE 9: Croatia has sent the album to number 1, as they did with “The Final Frontier”. The sales figures for the US is updated to 75.000, which is their best ever since the start of the Sound Scan era back in 1991. UPDATE 10: “The Book of Souls” is number 3 in Greece. This is two steps down from “The Final Frontier”. UPDATE 11: Iron Maiden scores another number 1 in Czech Republic. UPDATE 12: “The Book of Souls” is number 1 in Norway for the 2nd time in their career. UPDATE 13: Iron Maiden lost the no 1 spot on the Canadian Billboard to The Weeknd. The good new is that the band is number 1 in Portugal. UPDATE 14: “The Book of Souls” tops the Swiss charts and has reached number 3 in Denmark. UPDATE 15: Austria and Spain follows the trend and puts “The Book of Souls” in the glorious number 1 spot. At this point, Iron Maiden is number 1 in 15 countries. Still more to come. UPDATE 16: Number 2 in Poland. One step up from “The Final Frontier”, which entered at number 3. UPDATE 17: New chart entries are in, “The Book of Souls” claims the number 1 spot in: Argentina, Brazil, Colombia, Israel, Mexico, Serbia, Slovenia and a number 3 in Turkey and a number 4 in South Africa. The album is also number 1 on the the global char, with 310.000 units sold. That’s 61.000 more copies sold than “The Final Frontier” did in it’s first week in 2010. A remarkable achievement, so we can safely say that “The Book of Souls” won the battle. UPDATE 18: “The Book of Souls” climbed to number 1 in it’s 2nd week in Greece. UPDATE 19: After recounting the first-week sales for “The Book of Souls” in Poland, the album is now in the number 1 spot. UPDATE 20: “The Book of Souls” is number 1 in Chile, that makes it at least 25 number 1’s for Iron Maiden this time around. Post will be updated as more results are in! Number 1 also in Italy! Congrats, Iron Maiden! The success is well deserved. Hmmm – well I bought the vinyl and the cd and I bet I’m not alone! im afraid after 4 weeeks in the world album chart TFF is catching TBOS up fast and is only 18.000 sales behind.